It’s finally here! COIN HEIST, based on the YA novel by Elisa Ludwig, is now available to watch on Netflix! Additionally, the paperback movie tie-in copy of the book is currently available at Barnes and Noble. This fun story follows a group of classmates in Philadelphia who are unlikely friends but decide to work together on a plan they think of during a field trip. Adventure ensues as they try to attempt the impossible and find out more about each other and themselves in the process. More info can be found below. The last place you'd expect to find a team of criminals is at a prestigious Philadelphia prep school. But on a class trip to the U.S. Mint - which prints a million new coins every 30 minutes - an overlooked security flaw becomes far too tempting for a small group of students to ignore. United by dire circumstances, these unlikely allies - the nerd, the slacker, the athlete, and the perfect student - band together to attempt the impossible: rob the U.S. Mint. This diverse crew is forced to confront their true beliefs about each other and themselves as they do the wrong thing for the right reasons. 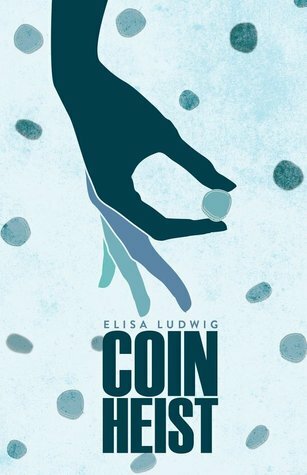 Elisa Ludwig's COIN HEIST is a fun, suspenseful and compelling thriller, told from the revolving perspectives of four teens, each with their own motive for committing a crime that will change all of their lives - if they can pull it off. Learn about the author, Elisa Ludwig here. What do you all think of the movie trailer? I'm planning on watching tonight!